everybody, at one point or another goes thru this ….you know, the doldrums. that period of time when you know nothing is really wrong but, at the same time, nothing feels right. yup, you’re in the middle of the doldrums. things are dull ... you feel listless and down ... nothing gets done and it seems like you’re drowning in the yucks. wallow? go the self pity route? cry? I’ve done each one of these before and lordy, it wasn’t pretty and it didn't help one whit. listen, Itotally get it. it can seem like you’ll never get to the other side of these down-in the dumps feelings*. you feel so bleh and nothing motivates you. every single time it happened to me I could not shake it but deep down, even as I'm binge watching a 2nd hour on netflix (yeh I know), I knew I had to do something different. because denial does no one any good. recognizing that you're in the middle of the yucks is one of the most important parts of releasing it. you can't release what you don't know, especially if you are choosing not to see it (yeh oh yes, this one chickadee). allowing the space for it is about checking in ( you know...with that inner wisdom in you) to see what the underlying problem could be. 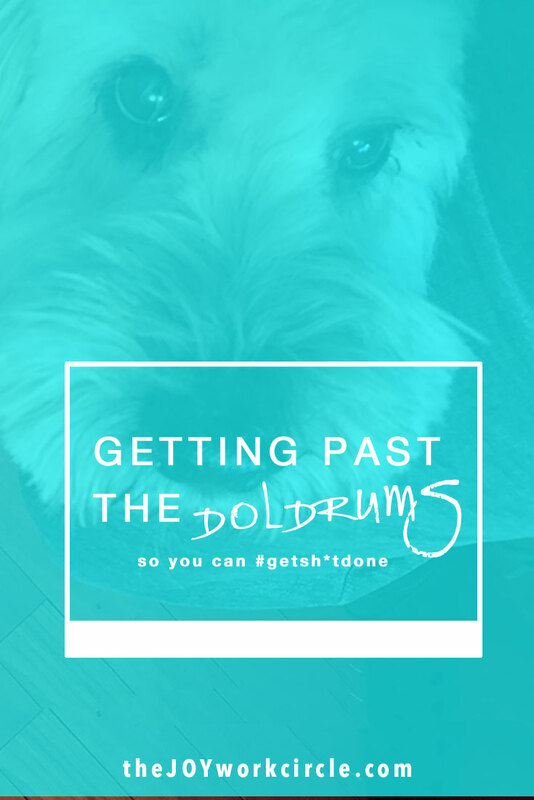 why have the doldrums showed up? what's the feeling behind it? dig a little here....or journal. your inner critic will try to show up right about now but in acknowledging what's happening (#1) and dealing with it in a proactive, open way (#2) you give her less room to step in and start doing her thing. when there's something on our minds but we are in go, go, go mode, that thing we're not thinking about just sits around the periphery waiting it's turn to speak. but it's also taking up a big chunk of the CPU of your brains hence...the doldrums! one of the many things I’ve learned going thru this life coaching course I'm on is that sometimes we need to just sit with a thing. yup, just sit in a thing and let it move thru us instead of trying always to push it away. when I push it away that's the work ethic in me rising to the surface and, instead what I should be doing is allowing space for my feelings and working thru them because they are there for a reason. remember in the previous Soul Speak minisode I talked about when the inner critic shows up she’s trying to tell you something? so are those feelings of listlessness and unrest. But if we constantly push away from feeling them we won't know how to serve ourselves in the long run. it's as if experiencing those feeling as they come up is our way out. sometime resistance is necessary and sometimes, love, it just gets in the way. I have things that need to get done, projects that need to be worked on, ideas I want to get out there into the world. and a set of doldrums does not help me move in a forward motion. in the example I give in the Soul Speak video above (click image to listen) I could not cease the doldrums that whole week. I woke up bleh each day. it was only when, for the 3rd time in as many days, my son asked if I was okay, I realized I was trying hard not to be bleh but wasn't doing a very good job of pushing it away. it still showed up. that's when I paused and knew I had to take 5 or 10 minutes to sit in silence. I had to help those feelings move thru me rather than crowd around me blocking my view, but also, preventing me from engaging with my family and with the things I wanted to accomplish that week. move thru your feelings. write down what's coming up about them but definitely don't brush them aside. they are present for a reason. your job is to find out why and help them process thru you. let them instead be a beacon of light to move you away from the darkness that continues to shade and obscure. let your moments of doubt and uncertainty propel you forward, lift you up, shine a light on what needs to happen for fulfilment and possibility and truth to reign. when those bleh feelings come up, allow them space, but be prepared to listen to their message. they are telling you something you need to pay attention to, those inner whisperings of your Soul. ........trust that the Universe has your back. * please know when I talk about the doldrums I'm not talking about depression, which is a serious condition. if you feel you are experiencing ongoing depressive thoughts, please contact a mental health professional.